This is not a live link.You'll need to type the address into your email. My apologies for the inconvenience. The reason is to avoid getting a dozen spam messages a day through having my email address on the net. Would you consider contributing to the catalogue? This catalogue contains pictures from collections large and small, but as you might have noticed there are still many gaps. Some of the missing numbers may never have existed, some may have been a single small batch now gone forever, but others are undoubtedly to be found gracing mantelpieces and china cabinets - or perhaps a forgotten dusty box - throughout Australia and beyond. If you have pieces not yet in the catalogue, or any comments, recollections - anything that will be of interest to enthusiasts - we'd love to hear from you. Depending on the wishes of individual contributors, all contributions are acknowledged. Email is the easiest way to send pictures, or alternatively contact us about an address for letter post, or to arrange a visit to your collection to take pictures. I'm not buying or selling, I'm not a dealer, but based on visits to date I think I can promise a pleasant hour amongst the Remued. I live in Melbourne and so can easily visit near there, and I travel interstate from time to time. * First, most obviously, missing numbers, not yet pictured in the catalogue (check the tables, especially the Early Series table). * Anything numbered in the 500s - either 500 Series or Later Series. * New and different variants of numbers that are already in the catalogue but with different suffixes. * Anything that will shed light on dates of manufacture. In particular, numbered items that have an incised date as well as a shape number. These are rare and of great value in piecing together the history. Plus any alternative source of dating - like "This was my grandmother's wedding present and she was married in 1941". * Pieces with applied decoration of koalas, lizards, kookaburras or other creatures. These are rare. More examples are needed to understand the series. * Numbers that currently only have one example pictured. A second is always wanted. * Photos should include a picture of the base and be accompanied by approximate dimensions. 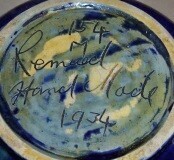 Base incised 154 M Remued Hand Made 1934; a Remued shape number and a date! Some contributors like to see their pictures acknowledged, others not. We believe we have scrupulously adhered to contributors' wishes but if there's any slip-up, or if after seeing your pieces in the catalogue you have changed your mind regarding attribution, please contact us. A note of appreciation is due to anonymous vendors (or should that be 'pseudonymous'?) on eBay, TradeMe NZ, Gumtree and the like whose pictures appear here. If you see your diningroom table in the background I do hope that's ok. More to the point perhaps, please contact us if you wish to add a personal attribution or whatever. I'm away travelling and out of touch with my email until early May 2019. To avoid filling my Inbox beyond its capacity, please hold off emailing until then?